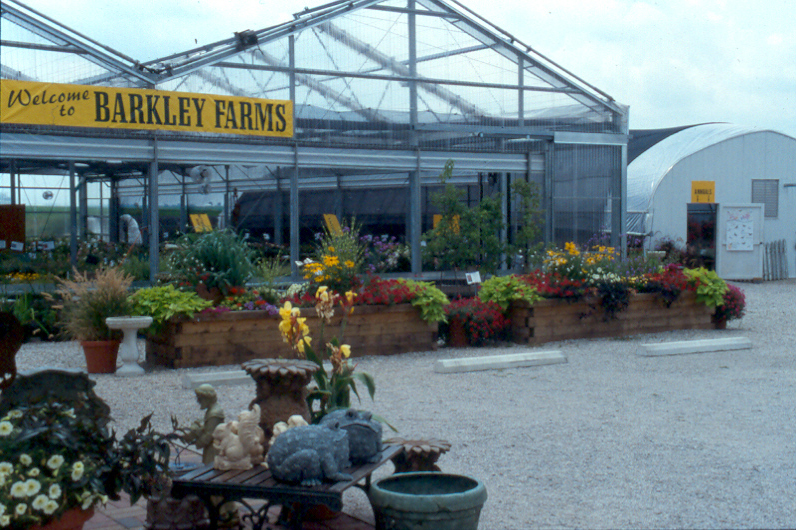 In spring 1992, Barkley Farms Nurseries was born as a wholesale plant nursery specializing in perennials, grasses and herbs. During that time, with the help of the Head Gardener, we successfully supplied many retail garden centers throughout Indiana and Illinois with our plants. This wholesale business grew and so did our customer base. But something happened a year or two later, people started to hear about us, and to come see this new plant business. Eventually, we were as busy selling plant out of our greenhouses to people coming to us, as we were growing plant, loading trucks and making deliveries. We made a huge decision to give up trying to supply our plants wholesale and opened as a retail garden center, with 2 acres of display gardens and eventually a gift shop with garden inspired home accessories, statuary, pottery and fountains. We’ve made so many friends during this time, as we’ve helped new gardeners, old gardeners, and many ages of gardeners. We’ve answered any number of plant questions, design questions, and helped solve plant and garden problems. As plant geeks we are always ready to talk plants to everyone. As many of you know, I also have a full time job at Lake Land College as the Horticulture Instructor. This has gradually taken more and more of my time, and the last few years, without the able assistance of my managers; it would have been difficult to keep up both occupations. Now, the time has come to make a decision, one that is a very difficult one. But as I, and my Head Gardener, are becoming more and more aware of our limitations, both mentally and physically, and because I’ve discovered that teaching new Horticulturalists is my passion, it is time for Barkley Farms to close its doors at the end of the this season. We plan to remain open for the month of June, Monday through Saturdays, and we will be marking down prices of perennials, grasses, trees and shrubs, gift shop items, etc. We can’t thank all of our wonderful customers enough as we feel we have made many new friends and many new gardeners. We wish you all well and hope you will all continue to enjoy plants and gardening for many years to come. Tucked away in a quiet country setting, Barkley Farms Nurseries offers a unique horticultural experience. Perennials are our specialty – as a grower, we concentrate on plants that we know are well-suited to the environment of this Midwest region. Among the thousands of varieties, you will find perennials for a sunny area, selections for a shady garden, plants that attract butterflies and hummingbirds, or varieties for gardeners with limited time for gardening. You will also find the largest selection of ornamental grasses in this region, with expert help in choosing just the right grasses to complement your own gardens. Trees, old-fashioned flowering shrubs and carefree, hardy shrub roses are also part of what you’ll find, as well as a great variety of colorful annuals with which to transform your own personal spaces. Comments Off on June Hours!